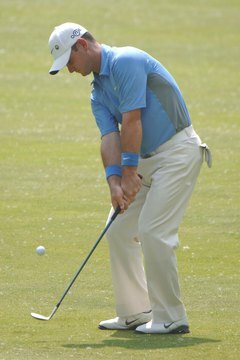 PGA Tour player Rory Sabbatini play this wedge shot from an open stance. It's rare for any player to hit every green in regulation, which means your wedge often gets a good workout. To use your wedge successfully, it's important to understand how to set up for your shots. On the practice range, you can use an extra club to help you learn the proper procedure. Choose your target. You may have used a club to mark your target line when practicing full shots. For now, just pick a spot between the ball and target that allows you to visualize your target line. Place the extra club on the ground to mark the ball position. The club shaft should point directly at the ball, but it will lie perpendicular to your target line and extend back between your legs. The club provides the crucial setup reference point you need. Take your stance with the club centered between your feet. Make sure both feet are parallel to its shaft. In a wedge shot, the ball needs to be in the middle of your stance. Angle your lead foot toward the target. (If you are right-handed, that's your left foot.) By angling your foot, you make it easier to turn through the shot. Here is where the club shaft comes into play. Leave your left heel on the ground; just lift the ball of your foot and pivot on your heel. The ball now appears to be much farther back in your stance, but it's still in the middle. The middle of your stance is measured between your heels, and the shaft will help you identify how much adjusting the angle of your foot changes the apparent ball position. Put a little more weight on your lead foot. This helps you to hit down on the ball and, when the ball is in the rough, catch less grass between the clubface and the ball. This will improve the consistency of your contact. Swing your wedge to test your setup. Many players find that this is a comfortable position from which to play their wedge shots. If you feel a bit "cramped" in this position, you can move your lead foot back slightly from the target line. Simply use the club shaft on the ground as a guide and move your lead foot straight back a couple of inches. This opens your stance slightly and makes it even easier to turn through the ball. Learn this position until you're confident you'll remember it. On the practice range, you can lay a club on the ground, but Rule 14-3 of the Rules of Golf forbids it during a round. Before long, this setup will be so comfortable that you won't need the club anymore.